While at Apple, my job was to work with developers to help them build great products for Apple Platforms. At Apple, when we said “great products,” we meant beautifully designed, compelling apps that take advantage of the latest and greatest hardware and software features— whether it be the features in the latest OS, or in latest piece of hardware. In my experience working with developers, some were very receptive to integrating these technologies, some not so much. Regardless, all wanted to know one thing… HOW DO I GET FEATURED!? Below are some quick tips to follow in order to give you a better shot at it! No Brainer: Make an amazing app! List of Previous Editors' Choice games. Notice, good amount of smaller, Indie devs. No favoritism! Apple considers the “best experiences for Apple customers” experiences that use Apple’s unique hardware and software features. This means that every time a new OS or device is launched, it’s in the company’s interest to highlight apps and games that are using platform differentiating features. Besides, why else would someone buy an iPhone over an Android device if there are no differentiating features? Apple builds the technology but they rely on developers to integrate it in order for the consumers to really benefit from their technical innovations. That said, the Editorial team is always looking for games and apps that are either using the latest, greatest technology really well, or in a really unique way, or both! Pay attention to the new features and find ways to integrate them into what you are doing in a unique and compelling way — you’ll give yourself a huge leg up on the competition! iPhone X launched over a month ago and iPhone X optimized apps are still being heavily featured. Likewise, iOS 11 launched almost 3 months ago and AR Games have a dedicated page. When Apple announced iOS 11, there was an overwhelmingly positive response about the App Store redesign. Developers were excited about the new features that were now built into the store like the separation of Games and Apps, the Today tab and all of the new features now built into the developer product pages. The Today tab in particular is a game changer because it allows the App Store to be more dynamic, and it finally gives App Store visitors context as to why an app or game is worthwhile via the six stories that are published every day. This is the type of context that has been missing from the store since its inception, and is really a powerful tool for Apple and developers. Where do these stories come from? Well, everywhere! Some are baked up internally by the Editors, some are a result of collaboration between the Editors and developers and some are stories that developers pitch to Apple. You think you have a great angle for a story? Pitch it to Apple! 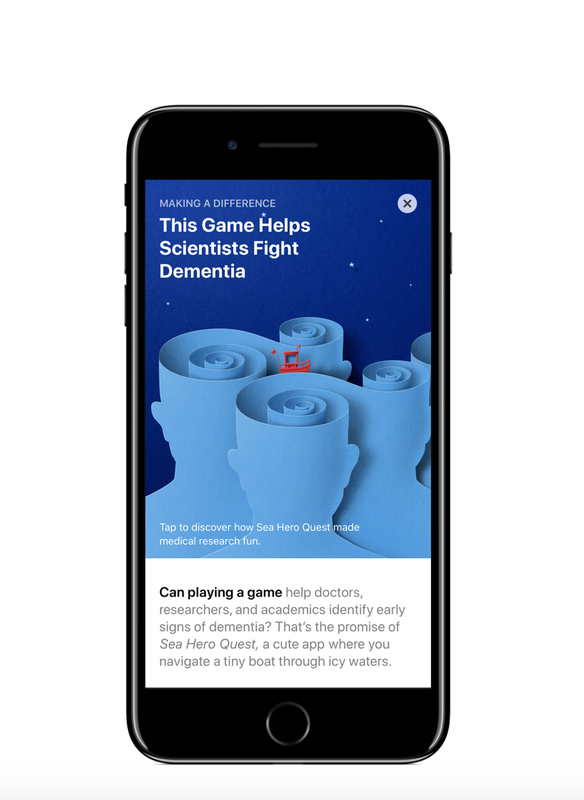 Awesome story on Sea Hero Quest and its impact on the fight against dementia. Stories like these are a result of collaboration between Apple and developers. Read more here! Exclusive Story that debuted on the App Store ahead of the launch of Reigns 2! Check it out. Marketing has obviously become more and more sophisticated on iOS over the years. In contrast to a few years ago when it was common for a developer’s marketing plan to be “we are hoping we get featured by Apple,” developers have become increasingly self sufficient when it comes to their marketing. Apple loves this! As crazy as it sounds, not relying on Apple to market your app is a good way to garner some attention. Over the years, Apple has also gotten more involved with giving developers guidance on their off the store marketing to help them amplify their efforts. When you have the foundations of a good, interesting and compelling marketing plan, there could be opportunities to work with Apple’s Marketing teams. This may give you more visibility internally and potentially lead to a feature nod. Create shareable assets as a part of your launch marketing and you may get retweeted by the App Store marketing team! Now, I’m not saying if you do all of these, you are guaranteed to get featured by the Apple Editorial team, but if you do do all or some of these, it will vastly improve your chances of being featured on the store. Try it out and report back results! GOOD LUCK! 5 things developers do that peeve users.... BEFORE THEY EVEN PLAY!